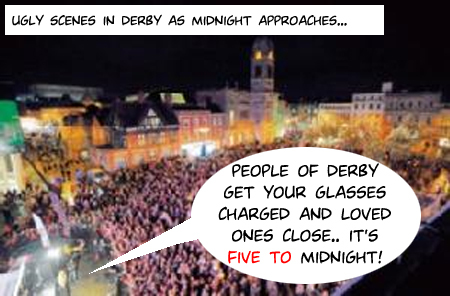 A new year riot kicks off in Derby.. | Through the seasons before us..
A new year riot kicks off in Derby.. Through the wonders of technology a final post for the year (or possibly a first one of the new year depending on how well it publishes it according to my instructions) to point a childish finger and chuckle down the A5-2 – after all, what better way is there? Those of you reading, 2010 has been a blast – we’ve had highs and we’ve had lows on the field – but we’ve not lost at home in regular league fixture for one thing – amongst plenty to be pleased about. Thank you all for your support over the year which sees the site continue its’ upward trajectory in popularity, I really appreciate it. At the moment this post goes live I’ll be in a drunken circle of people singing Auld Lang Syne, and starting to regret the fact I drank quite so much given our game against Barnsley on New Years Day. A very Happy New Year to you all, even the Derby fans who might happen upon the site from time to time (so long as that doesn’t extend to your game against Preston of course!). Cheers! What time do Sheep eat? Five to…. too much time on you’re hands seriously ! Happy NY to you too NFFC and all other readers of this very good blog!